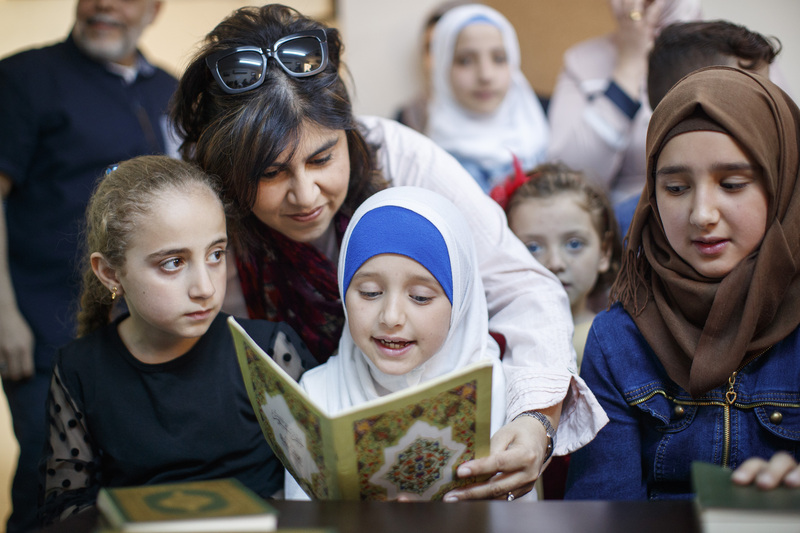 Baroness Sayeeda Warsi, who was chair of the Conservative Party and a senior minister at the Foreign Office, has just returned from meeting Syrian refugees on a visit with Muslim Aid to the Turkish side of the Turkey/Syria border. She broke one of the first fasts of the Ramadan month, which started at the weekend, with Syrian refugees in a Widow and Orphans’ Project refuge after spending the day in Boynuyogan refugee camp and at the National Syrian Project for Prosthetic Limbs. Children and adults, who have lost limbs due to the bombardments of the war, come to the clinic in the Reyhanli district of Hatay Province for help, within view of the border with their home country. One of the refugees at the clinic whose story moved Baroness Warsi deeply was Saif al-din Ali Akta, a five year old boy who had the lower part of both his legs blown off in a missile attack which killed both his brother and sister. 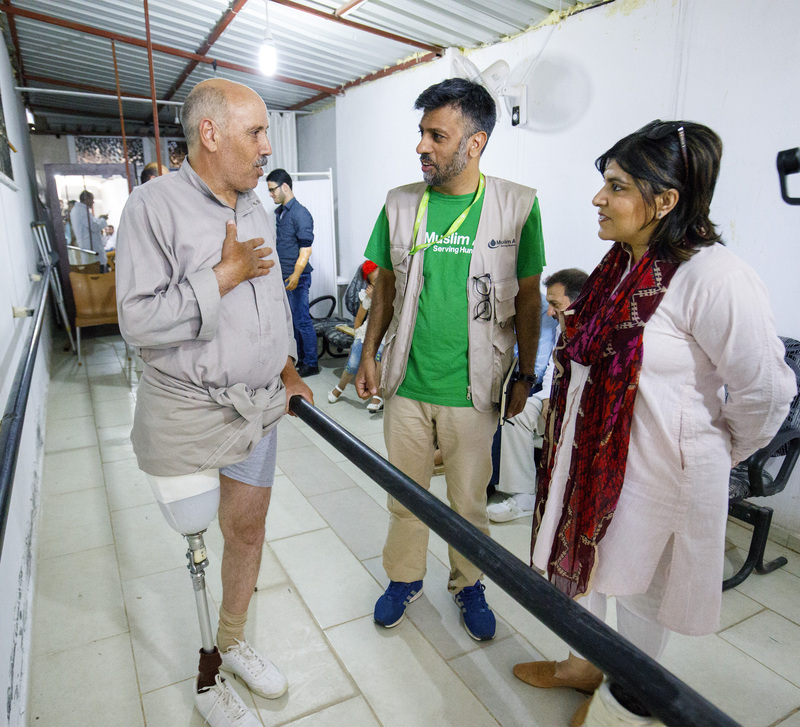 Baroness Warsi stayed with Saif al-din, who is not able to move himself around on his stumps, as he had prosthetic limbs fitted, and saw him start walking a little distance on his new legs. “Unfortunately in Europe we only seem to focus on refugees when they arrive on our shores. When other political issues have become a priority, it is almost for us out-of-sight, out-of-mind. So I am hoping is that, as children like Saif al-din are in-sight for me, they are in-mind for me, I can use that to make sure other people in Britain don’t forget that this crisis is far from over”, says Baroness Warsi. Saif al-din’s mother, Mana, now 33, had to leave her home three years ago without any preparation, because of the siege of Aleppo. At the end of last year, government forces embarked on a decisive campaign that resulted in the recapture of the city after a four-year stand-off between the government and opposition. Mana and her four children fled in the direction of the Turkish border, but on the way a missile struck them, killing her 13-year-old daughter and five year old son. Saif al-din’s eldest brother, now 18, also survived but lost one leg from the hip down. Mana still suffers from pain caused by shrapnel wounds in her legs. “I would love to go home to Aleppo, but I know it’s an impossible dream,” says Mana, through an Arabic translator, admitting that she has her hands full caring for her two surviving children who are both so disabled. She speaks no Turkish and does not feel at home in her new country. She says that she cannot speak about the feelings she has about what has happened to her family, otherwise she would not cope day-to-day. Asked about her husband, Mana turned her face away, clearly unable to respond. Later on, the visiting party witnessed further progress at the Boynuyogan refugee camp where 8,000 people (2,000 families) live in small cube-style houses, on two floors with a private bathroom. 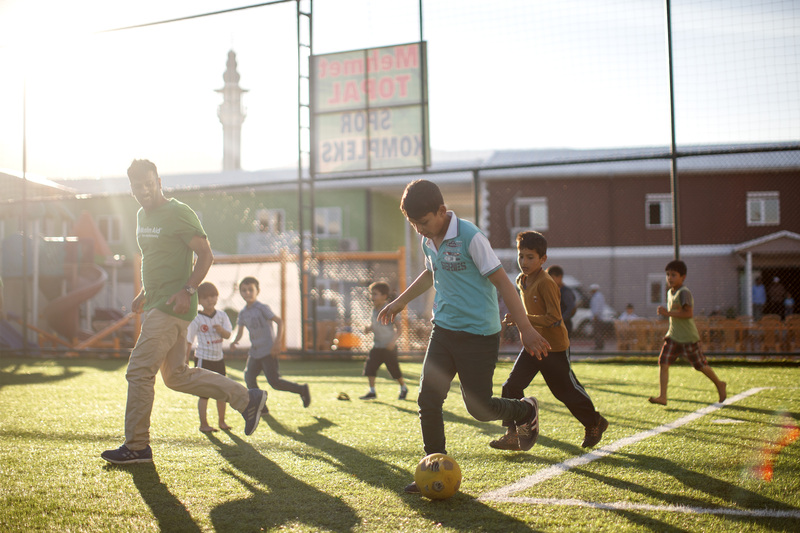 The camp has large open areas, a playground, a café, a few shops such as one named Rosemary which sells perfume, a school with 115 teachers of whom 74 are Syrian and its pride – the supermarket which stocks everything from hair products to fresh vegetables. Each adult in the camp is allocated 100 lire (£21) per month in vouchers to spend in the supermarket. “It is heartening to see the inspirational work the Turkish Red Crescent and Muslim Aid partner, Syria Relief, have done to ensure that people are not living in squalid camps,” says Jehangir Malik, Muslim Aid CEO, who accompanied Baroness Warsi and who has visited Syrian refugees regularly since the crisis began. “This voucher scheme for shopping is very popular, as it means the families can choose what they want to buy, they have that independence, instead of receiving handouts. It is helping restore some self-respect and normality to life.” Six months ago Boynuyogan camp was still just tents as it had been for six years since people started flooding over the border. Muslim Aid supports 14 hospitals, a trauma treatment centre and emergency relief inside Syria, as well as working in Lebanon and Jordan with Syrian refugees. Mr Malik was in Turkey to develop funding plans for refugees there. Turkey hosts nearly 2.7 million of the 4.8 million Syrian refugees displaced worldwide (see Notes to Editor).